This month marks the tenth anniversary of one of the most iconic handset designs of all time - the Motorola RAZR V3. What made the RAZR different was the care put into its physical design. The ultra-slim aluminium clad clamshell was like no other phone, and it challenged people's concepts that a phone should be an ugly brick. One thing that the RAZR V3 had in spade was "wow factor". Priced at $700+, the RAZR V3 was a premium handset at a premium price selling for iPhone money today. Cleverly this made the RAZR rather exclusive and even more desirable when it first came out. Motorola then cleverly made an even more exclusive black version handed out to attendees at the Oscars which further enhanced the RAZR's reputation as a handset for the rich and stylish. Underneath the red hot exterior, the RAZR was a pretty tepid affair. The internals were based on the Motorola V500 series which had been launched the previous year, it featured a relatively large 176 x 220 pixel TFT display with a smaller external one, a VGA-resolution camera, Bluetooth, GPRS data, a puny 5.5Mb of memory and really not a lot else. You couldn't play music on it, capture video or use a memory card. And worse than that the user interface was truly horrible, reflecting a fundamental weak point in Motorola's design. Despite the weaknesses in the phone, sales were huge and 130 million V3s in a wide variety of colours were sold. 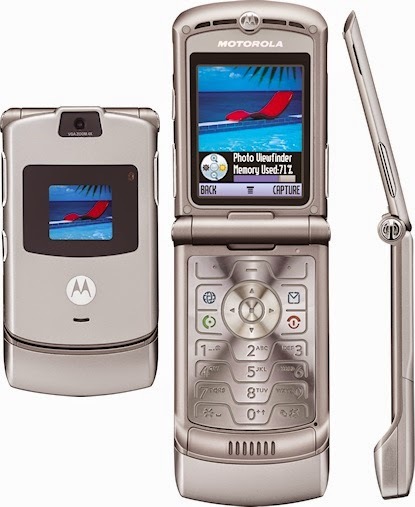 But it was perhaps the weaknesses in the phone design which meant that RAZR owners tended to switch to another brand once they replaced their RAZRs, leading to a long and nearly terminal decline for Motorola which failed to understand that a fashion phone is only a good thing as long as it is actually in fashion. 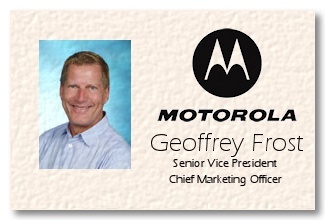 The man behind the RAZR (and the complementary PEBL) was Geoffrey Frost, a marketing executive who was recruited from Nike. He set out with a singular vision for what he wanted in terms of a design, which was something radically different from Motorola's fairly conservative designs to date. Frost reversed Motorola's declining fortunes with his strategy, and perhaps Motorola would be a very different company today if it wasn't for his tragic death in November 2005, aged just 56, coincidentally the same age as Steve Jobs when he died. A combination of brilliant and frustrating design, the RAZR remains an iconic device which demonstrated that smart industrial design and good marketing can make a huge difference, something that Apple certainly knew when they launched the iPhone in 2007. And although phones today are definitely more capable, they are much more boring than this metal-clad masterpiece.